Boquist sent this email to numerous recipients with the email addresses of over 100 people openly published in the “To” line. How many others received it without their addresses being published is unknown. We would like to respond point by point to the email which takes issue with those who opposed Boquist’s gun confiscation bill, SB 719 A. Before we do that, we want to share an email that Boquist sent to OFF and the local NRA rep on April 19. That appears immediately below. In it Boquist includes an email he received. The only change we made was to remove the email address of the sender. Its vaguely threatening tone insinuates that somehow OFF and the NRA are responsible for threats against Boquist’s wife, a suggestion that is shameful and completely false. This email was cc’d to the entire Republican Senate Caucus and shared with the press. Following that is Boquist’s response to those who opposed SB 719 A. We will respond point by point. Boquist’s words are in bold. Our responses will be in red. This will be a lengthy post, but we cannot allow Boquist’s mendacious comments to go unanswered. Just so it is damn clear. I do care about veterans blowing their brains out even if OFF and NRA does not. And no amount of emails or calls will change this fact. Niether of you ever served to my knowledge. I’m perfectly fine taking heat in any form from your efforts as the callers and emailers are citing your two organizations. They are identifying themselves from OFF and the NRA. But be damn careful what your members say to my wife as I will not tolerate threats to her. Today, she was one inch short of having the State Police up based on one of your members in front of her desk. While I doubt the two of you really believe the below email but you are getting the blame. What part of the second amendment do you not understand? It is none of your business if someone decides they don’t care to live any longer. Remember, this is Oregon and people have that right in this state. People will use whatever tool is at hand when that moment comes. Just because your son used a gun doesn’t mean you can confiscate them from everyone else. What if he had driven his car off a cliff? Would you confiscate cars or demand people whose properties have a cliff must give their property to the state? It only sounds absurd because it is, just like your dumb idea. You should change your affiliation to demoncrap because you sure don’t represent republicans. I’m sure you realize you will never be reelected so, Good Riddence you worthless piece of crap. You all contacted us with your negative thoughts on the suicide prevention bill modeled on a decades old Connecticut law that is credited with saving of lives. This is misleading at best. The fact is, that while Boquist did lift some language from the Connecticut bill, to suggest that his bill was “modeled” after it is absurd. The Connecticut law, while certainly flawed and ripe for abuse, has several important safeguards that Boquist’s bill intentionally stripped out. For example, the Connecticut law requires that the gun confiscation order be requested by either state’s attorneys or assistant attorneys or TWO police officers. The order cannot be granted until after an official and independent investigation has been conducted by either the state’s attorneys or the police. The Connecticut law requires that after 14 days, a court hold a hearing to determine if the confiscated firearms should be returned. The state, not the person whose property has been confiscated, has the burden of proof, by clear and convincing evidence, that the respondent is a danger to himself or others. Boquist’s bill allows the court to order gun confiscations based on nothing more than an allegation by a “family or household member.” There is no investigation. Furthermore, “family or household member” means “a spouse, intimate partner, mother, father, child or sibling of the respondent, or any person living within the same household as the respondent.” There is nothing in the bill that says “intimate partner” has to be a “current” intimate partner. Under Boquist’s bill the person whose firearms are confiscated must themselves request a hearing, at their own expense, to request that the order be removed, and unlike the Connecticut bill, the accused must prove their innocence by clear and convincing evidence. That means you must somehow prove you are not dangerous, a virtually impossible hurdle. You are guilty until proven innocent. Boquist also states that the Connecticut bill is “credited with saving lives” but the study he links suggesting that, is at very best, speculative and clearly biased towards a specific conclusion. There is simply no way to prove whether a person would or would not have committed suicide or some other violent act. Likewise, multiple States have existing similar laws including Washington which passed by 70% before statewide voters. Yes, Washington did in fact pass a terrible law that, like Boquist’s, allows for the theft of a person’s property without any conviction of a crime. However even the Washington law has safeguards built in for the respondent that Boquist stripped out. Furthermore, to suggest that because the voters in another state ignorantly approved an attack on their liberty and property, that that is reason to impose it elsewhere completely ignores the reason we have Constitutions and legislators take oaths to them. Sometimes the majority is wrong and we have constitutional safeguards for this purpose. This is, apparently of little importance to Boquist and the Democrats who supported him. It is apparent you contacted me based on an Oregon Firearms Federation fundraising alert, or a fundraising email from the California gun dealer’s dba Firearms Policy Coalition whose lobbyist is a contributor to Breitbart. Here Boquist takes a page from Floyd Prozanski’s playbook. The clear implication is that somehow the many warnings OFF sent out about this bill were simply “fundraisers.” It’s interesting that Boquist suggests that people who contacted him opposing the bill were doing so only because OFF and FPC advised them to do so. However, while the NRA worked with Boquist on this bill from its inception, they too opposed the bill and urged their members to oppose it. Unless you are verbally propagating suicide to your household members or threatening to murder them, the new law will not impact you at all. Likely, it will only impact less than a few hundred Oregonians a year. This is clearly nonsense and an outright lie. As we have pointed out over and over, the bill allows for gun confiscation for people who have done nothing more than purchase a firearm in the last six months, have ever had a DUI, or use marijuana products. Boquist knows this and no amount of lying about it is going to change the law. However, if you are only interested in blindly funding OFF and FPC then please hit the delete key now. Yes, “blindly funding OFF”. Clearly if you oppose unconstitutional attacks on your rights, you are “blind.” Yes. OFF does raise money. It costs money to fight the attacks on our liberties that Boquist gets to make with your money taken from you involuntarily. But it is curious that Boquist does not suggest that any donations made to NRA are the result of blindness. If you give to them, even though they also publicly opposed the bill, your vision is, apparently, quite clear. Also, if you want to fire back rhetoric without reading further just remember your email is already a public record for which the federalists no doubt already possess at the NSA. All government emails at the Legislative level are stored in the ‘cloud’ by a third party thus not secure. OK now it’s getting spooky. Boquist has grown increasingly erratic over the last few years, but this is weirder than usual. We can only guess what the implications are. Our best guess is, if you oppose unconstitutional legislation, the National Security Agency is coming to get you. We think anyone who has read the news in the last 10 years knows that emails are not secure, but we are pretty sure that opposing Boquist’s bill will not get you visited by the Men in Black. The purpose of SB 719 and SB 868 is suicide prevention. No. This is also a lie. There is not ONE WORD, not ONE WORD in SB 719 about getting any kind of assistance for people who are suicidal. In fact, an amendment that was offered that would have required that there at least be some attempt to get help for suicidal persons was rejected. This bill is about firearms confiscations from people who have been convicted of nothing. Oregon ranks 4th in the nation for suicides. Oregon is top of the list for military and veteran suicides. The leading death of young people is suicide. Every day 22 veterans commit suicide in the nation. I could write pages on this problem along with the total failure of two Presidents (R&D), and multiple Congresses (R&D), and our own State ignoring this fact along with their list of excuses. 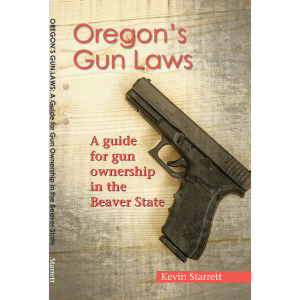 If you really care then look at the 20 plus floor documents at the link below outlining the problem we face in Oregon and America. It is obvious very few of you read Kevin’s or Phillip’s link to the bill, and maybe none of you researched the Oregon Legislative Information System history, testimony, and hearing process of SB 868 which I sponsored after a decade of trying other solutions. I can honestly say I do not recall ANY of you ever offering a solution in the past decade as America abandoned it’s (sic) veterans. This includes those of you who served too. You see, if you have not single handedly provided a solution to an issue that has vexed humanity since the dawn of time, you are the problem. But once again, Boquist’s solution is to punish people who have done nothing wrong and offer no help to people who actually need it. This comment is perplexing. What point is he making telling us when the bill passed the Senate? We know that. He says “most of the comments we received are factually incorrect..” Ok, which ones? Militia clause. The U.S. Supreme Court dominated by Republican appointees in DC v. Heller very clearly established firearm ownership as an individual right with restrictions exactly contained in the suicide prevention bill. See link. Due process. The U.S. Supreme Court dominated by Republican appointees in Mathews v. Eldridge along with multiple other cases have established a due process requirement time line less than are contained in this suicide prevention bill. See link. We did check the link. It is to a Wikipedia page that is about a Social Security dispute, “needs additional citations for verification”, and does not even contain a link to the actual court case. Ex parte. The U.S. Supreme Court dating back to the early 1800s to present have set out the ex parte requirements in cases such as Merryman, Milligan, and others. Ex parte is well established in criminal and civil law across America including Oregon. Plus the penalties for false allegations are larger than non-compliance as the goal is suicide prevention, not the fundraising rhetoric most of you failed to check out. There he goes again. Any info provided to oppose this bill is nothing more than “fund raising.” Boquist cherry picks court cases with little documentation to excuse his outrageous attacks on Constitutional liberties. But to promote attacks on your rights, simply because you believe a court somewhere approved is a complete abdication of your role as a guardian of liberties. As a supposedly devote Catholic, Boquist claims to oppose abortion, but why should he? The court said it’s ok! For the public record, ex parte, due process, and militia clause elements of SB 719, and SB 868 originally, were improved & narrowed based on written suggestions by the National Rifle Association along with others. We cannot approve NRA’s willingness to work with Boquist to craft this horrible legislation. We can report that they did consistently oppose the bill even if they did help create it. We don’t know who the “others” are. We can email you OFF’s and the NRA’s correspondence. We don’t know what Boquist is talking about here but we welcome him sharing any “correspondence” since it won’t include anything our supporters have not already seen. Read your NRA, OFF and FPC alerts carefully as they are competing for your donations by stating their propagandized positions very carefully as they know the law too. Well it’s a good sign that Boquist finally acknowledges that the NRA is part of the evil cabal that is only trying to steal your money, but we must respond to his comment about “propagandized positions.” So to that we say: ok Boquist, you have shot your mouth off. Now show us were any information we have provided is not 100% accurate. Just like Prozanski, Boquist has chosen to make malicious and false accusations against OFF, and just like Prozanski, he provides no examples. Extreme risk protective orders designed to prevent suicide or harm are fully constitutional pursuant to the U.S. Supreme Court adjudications of the U.S. Constitution. ERPOs have been in place for decades in other States. Heller, Mathews, Milligan, and Merryman rulings are not one’s you want to overturn if you cherish due process and your individual rights. The question is do you really support the U.S. Constitution or you want to pick & choose parts based on your own interpretation. While we think Boquist’s analysis here is pretty weak, the reality is, the theft of property with no accusation of a crime is an outrageous assault on Constitutional principles no matter what idiot ruling a court has made, and Boquist’s reliance on court decisions to promote his anti-gun agenda is a dangerous game. No doubt Boquist agrees that black people are only 3/5ths human because the court said so. He must believe Obamacare is a legal “tax” because the court said so. Perhaps Boquist should visit the Oregon Supreme Court’s decision in the “Charles” case where they concluded that people have an obligation to run away from attackers, a position they reached in complete contradiction to black letter Oregon law. Several groups competing for dollars knowingly made numerous inaccuracies to get donations. Kitchen knives are not deadly weapons under any law in Oregon. Boquist here simply decides to ignore the plain language in his bill. Read it for yourself and see if you can possibly conclude that knives will not be included under the bill. Sure, there is nowhere in Oregon law that says “kitchen knives are deadly weapons” but Boquist’s bill will certainly include them. Third party transfers were covered in depth at public hearings at the request of the same groups making wild claims in their alerts. Timelines for the judicial hearings processes were changed at the request of the same gun groups. As was the use of clear & convincing evidence before a judge not the normal weaker constitutional standards. Once again, what “groups?” Other than NRA, what “gun groups” had any discussions with you while this bill was being crafted? We certainly were no part of any negotiations to steal people’s guns. Mental health. SB 719 is a suicide prevention bill not a mental health adjudication intentionally to preserve an individual’s 2nd Amendment rights. NRA, OFF and FPC know full well if a court makes a mental adjudication it is a permanent loss of gun rights under 18 USC 922(g)(4). Since SB 719 has multiple hearings and court options before a judge, such a mental health ruling would result in a No entry on line 11f on an ATF Form 4473 i.e. background check. For these reasons, the law specifically stated the process was not a mental health adjudication, and allows the respondent the choice if he or she wants to risk having such a mental health adjudication thus allowing them to seek help without a permanent loss of rights. See links. This is one of Boquist’s biggest frauds in a sea of fraud. Here Boquist tries to sell the idea that his bill’s prohibition on mental health evaluations is a “benefit” to the person whose rights are being trampled on and property stolen. But a review of the bill makes it clear that the victim of this legislation would not, in fact, be able to provide to the court, an evaluation by a mental health professional that declared them totally fit to own firearms! The court would not be allowed to consider a professional’s opinion the victim was not a danger to himself or others. You should note the Legislature passed other expansions of mental health and suicide prevention elsewhere in the Session including expanded services, 24-hour preventions, and police training. Wait, didn’t Boquist say “and our own State ignoring this fact along with their list of excuses…”? Which is it Brian? Elephants and rhinoceroses. The GOP’s Platform link is below. Everything in SB 719 conforms to the intent and words of the Republican platform. Suggest those of you making RINO claims read your own party’s positions. Our Right to Keep and Bear Arms We uphold the right of individuals to keep and bear arms, a natural inalienable right that predates the Constitution and is secured by the Second Amendment. Lawful gun ownership enables Americans to exercise their God-given right of selfdefense for the safety of their homes, their loved ones, and their communities. We salute the Republican Congress for defending the right to keep and bear arms by preventing the President from installing a new liberal majority on the Supreme Court. The confirmation to the Court of additional anti-gun justices would eviscerate the Second Amendment’s fundamental protections. Already, local officials in the nation’s capital and elsewhere are defying the Court’s decisions upholding an individual right to bear arms as affirmed by the Supreme Court in Heller and McDonald. We support firearm reciprocity legislation to recognize the right of law-abiding Americans to carry firearms to protect themselves and their families in all 50 states. We support constitutional carry statutes and salute the states that have passed them. We oppose ill-conceived laws that would restrict magazine capacity or ban the sale of the most popular and common modern rifle. We also oppose any effort to deprive individuals of their right to keep and bear arms without due process of law. We condemn frivolous lawsuits against gun manufacturers and the current Administration’s illegal harassment of firearm dealers. We oppose federal licensing or registration of law-abiding gun owners, registration of ammunition, and restoration of the ill-fated Clinton gun ban. We call for a thorough investigation — by a new Republican administration — of the deadly “Fast and Furious” operation perpetrated by Department of Justice officials who approved and allowed illegal sales of guns to known violent criminals. Maybe instead of making acerbic and unfounded accusations about your unwillingness to read the platform, Boquist should read it. It is telling that 19 Oregon House Republicans voted against funding State veterans programs including veterans suicide prevention and mental health. Odder, it was three Democrat legislators who got back the full funding level of Measure 96 with the help of two Republican legislators. Likewise, multiple Republican Central Committees in Oregon have openly opposed local law enforcement and public safety. So much for veterans and law & order platform in Oregon or by the Republican Congress. Federalist Republicans oversee an abysmal Veterans Administration, failed on immigration reform, and after three years in power have done nothing on health care. Somewhere, there is a point here, but we have no idea what it is or how it relates to Boquist’s confiscation bill. Let me remind all of you the United States is a representative republic not a parliamentary nation like Great Britain. America elect’s representatives not party hacks to sit in parliament. State Senators represent all 128,000 citizens of their districts. I represent Senate District 12 not some other district elsewhere in the State. Republicans account for 34% of Senate District 12. And more than half of them want stricter gun laws that I will not support. As has become the Boquist way, much like his fellow travelers in the Democrat party, Boquist offers not a single shred of evidence that this is true or why it matters. Only 27% of Oregonians are Republicans. Again, more than half of these Republicans want stricter laws. Those of you making the above RINO claims need to access your own party affiliation as most of you have expressed non-Republican views and platform positions. A link to change parties is below. We have provided the platform that Boquist links to. We think it speaks for itself and clearly contradicts Boquist’s assertions. Based on the fact the Boquist got exactly zero support from any other Republican legislator, we think it’s pretty clear that it is Boquist who should change parties. In closing, unless you are verbally propagating suicide to your household members or threatening to murder them, the new law will not impact you at all. Once again, a clear and outrageous lie. All you have to do to be affected by this law is have lawfully purchased a firearm in the last 6 months. Of course, if you have five ex-wives, beat your children, and hate local law enforcement, you have bigger problems than this new law. But if you have a better suggestion for reducing suicide, especially amongst veterans, then please take the time to make some constructive suggestions. Ok, this is simply mindless rambling with no connection to reality or the bill. But it’s important to know that while Boquist has repeatedly and dishonestly lied about the intent of his bill and attempted to sell this as his great compassion for the victims of warfare, his business is warfare. Boquist profits from war every day. Boquist is a mercenary whose fortune is soaked in blood. When you start to try to understand why a “conservative Republican” would promote an outrageous attack against your rights, property and liberty keep in mind why mercenaries do what they do. And it ain’t love of country.